The altitudinal variation in the energy balance components of the year 2000, shown in Fig. 34.2, is derived from a two-dimensional model (Klok & Oerlemans, 2002). This model is driven by meteorological input from synoptic weather stations located in the vicinity of Morteratschgletscher. Its spatial resolution is 25 m and half-hourly time steps are used. The model accounts for the effects of shading, surface orientation, obstruction of the sky and reflection from the surrounding slopes on the incoming shortwave radiation. 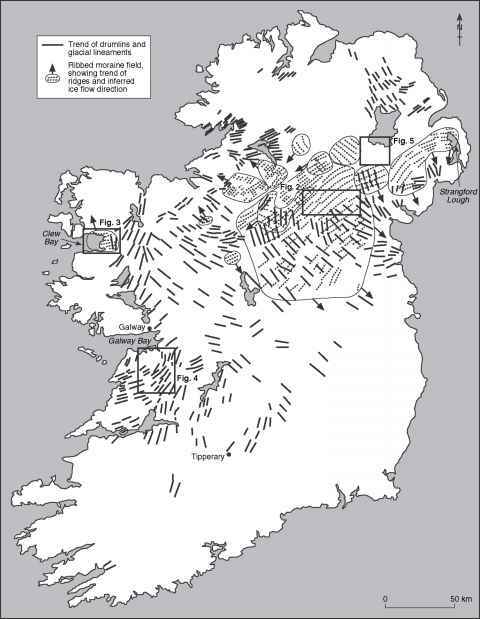 The albedo of each grid cell is estimated with the method of Oerlemans & Knap (1998). 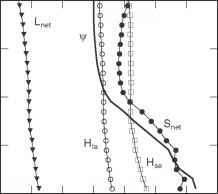 The parameterization of the turbulent heat fluxes follows the model of Oerlemans & Grisogono (2002). The conductive heat flux into the glacier is estimated from a simple two-layer subsurface model. Figure 34.2 Mean modelled annual surface energy flux (c), net shortwave radiation (Snet), net longwave radiation (Lnet), sensible (Hse) and latent (Hla) turbulent heat flux averaged over 100 m height intervals for the year 2000. Averaged over the year 2000, net longwave radiation becomes more negative at higher altitudes. Likewise, the turbulent heat fluxes decrease with altitude. These features can be explained by the decrease in temperature with elevation. Net shortwave radiation is at minimum at 3300 m a.s.l. and at maximum at 2100 m a.s.l. This variation is mainly due to variations in the surface albedo, but also due to the orientation of the surface, shading, sky obstruction and reflection from the surrounding slopes. Averaged over the entire glacier, these topographical effects reduce shortwave reception by 37%. The surface energy flux is approximately zero at the very high altitudes, implying that almost no melting takes place and the glacier surface does not gain or lose heat on an annual basis. 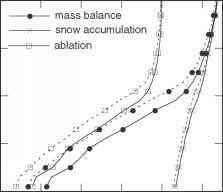 Figure 34.3 Modelled mean specific mass balance, ablation and snow accumulation for 100 m height intervals for the year 2000 (solid) and for a 1°C increase in air temperature (dotted). melt rate through changes in longwave radiation and the turbulent heat fluxes, enhanced by the albedo feed-back mechanism. Snow accumulation decreases little when the temperature increases. Altogether, the modelled mean specific mass balance of 2000 decreases by 0.70 m water-equivalent for a 1°C change in air temperature and becomes negative.